XIV, 576 p., 16,5 x 24,0 cm. Includes an extensive commentary and theological reflexion. Edited by Klaus Obenauer. 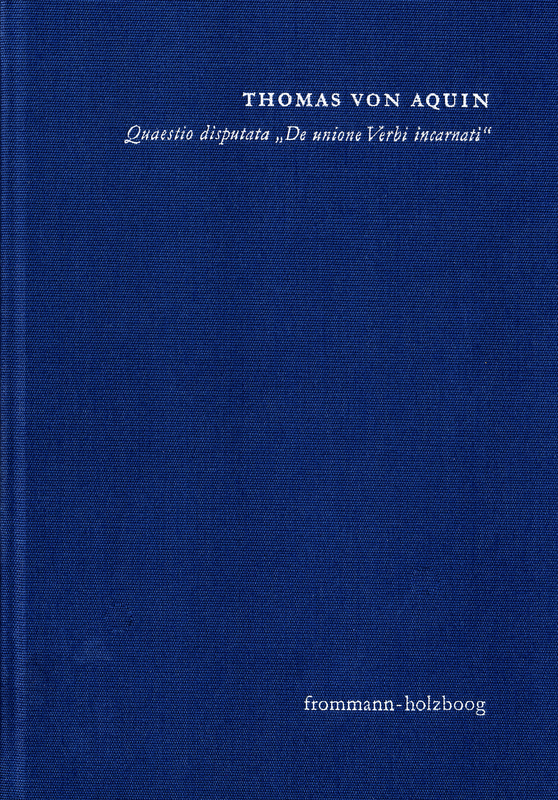 Latin text compiled by Barbara Bartocci, Klaus Obenauer and Walter O.P. Senner. The »Quaestio disputata« ›About the union of the incarnate Word‹ is one of Thomas Aquinas’ shortest Questiones. It contains, in an extremely condensed manner, the whole programme of constitutional Christology: The unity of the person and the hypostasis of Christ in two natures / Christ one or two? / The unity of esse and the duality of action and will in Christ. The last three of the five articles reveal a peculiar originality within Aquinas’ Opus. The volume investigates the proverbial onto-logical implications of the christology of the greatest thinker of Western Christianity. It provides an edition, translation, and extensive commentary with theological and historical reflections. Der Theologe Klaus Obenauer legt mir dieser profunden Studie eine herausragende Arbeit zum Text des Thomas von Aquin [vor]. [...] Mit dieser Publikation existiert nach mühevoller Kleinarbeit eine profunde Studie, die keineswegs, wie der Kommentator am Ende seiner Ausführungen außerordentlich bescheiden anmerkt, von der Ergebnislage ›alles beim Alten‹ beließe. Bei allem Respekt – im Blick auf den ausgefeilten und viele Detailfragen anschneidenden Kommentar, der eine gute Grundlage für die weitere Diskussion darstellt, ist vielmehr das Gegenteil der Fall!